Description: Goddess of rocks, clay, minerals, and other hard substances. Others say: Genetrix; Goddess of the sea; She Who was in the beginning the lone inhabitant of that island, which was the only land there was, floating in the waters of space; She Who, though of the earth, lives in the worlds above where She owns the moon and stars; She Whose major aspects are solidity and hardness; She Who created humanity by breathing life into female and male effigies who then became the Hopi ancestors; from the meeting of Woman, water and earth, Her creatures were born. To Whom Sacred: (She owns, that is empowers, or is identified with) all hard substances: moon, stars, beads, coral, shell, etc. Some say there is a Dual Huruing-Wuhti, below. Perhaps also called Kokyangwuti, linked through Sussitanako. According to some She is also known as SpiderWoman, but qv Sussitanako. Description: Dual Goddesss of primordial waters; the Two Mothers; Between Them They created the land and all life upon it; Those Who formed the first man and the first woman, parental ancestors of the Hopi people. They formed Tuwabontums, see below. 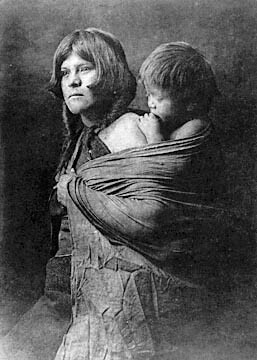 Description: The first Mother; Parental Ancestress of the Hopi people. Male Associate: Muingwu, ---, the first man. Brought into being by the Dual Huruing-Wuhti. Source: E,R.AIML/115 and see for more under `The White Dawn of the Hopi'; S,M.MAWv2/94.